Mr WILLIAM HANKIN On Tuesday, 29th November, there passed away at the Hobart Hospital Mr William Hankin, aged 64, a well known and highly respected resident of Geeveston. 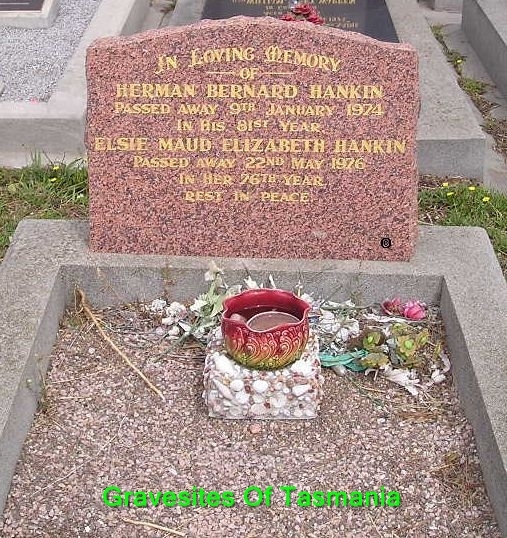 Mr Hankin had been in indifferent health for some time past and had some time previous gone to Hobart for treatment. The deceased had practically lived his whole life in the district and for a number of years was a member of the old road trust, the municipal council and fruit board, always taking a keen interest in the affairs and progress of the district, besides also during his lifetime creating a fine property situated on the Arve road. The funeral took place on Thursday at the Geeveston Roman Catholic cemetery; Rev. Father Hennessy of Franklin, performing the last rites. There was a large following of friends of the deceased and also numerous wreaths. He leaves a wife and eight grown up sons, three of whom are in New Zealand and one in Melbourne, to mourn their loss. HANKIN - On June 11 1934, at the residence of her son Albert, Arve Road, Geeveston, Mary, widow of the late William Hankin, in the 75th year of her age. Funeral will leave her son's residence, Arve Road, Geeveston, for Roman Catholic cemetery, Geeveston, on Wednesday, 13th inst., at 2.30p.m. when friends are respectfully invited to attend. Leo married Louisa Jane 'Jessie' Carruthers (1879-1937) in Wellington 23 Dec 1916. * Leo was a Farm Hand/Contractor in Wanganui when he enlisted in May 1916 for WWI. Served as Corporal 39992, F Company, NZEF. His next of kin was his wife Louisa, c/o Mrs Cumberbeach, 12 Cochrane St., Eglinton, Dunedin (sister? sister-in-law? see notes). NEWS from the war Information has also been received by Mr and Mrs Wm. Hankin that their son, Private Leo Hankin, has been badly wounded in the chest and legs. Private Hankin some years ago went to New Zealand from whence he went to the front 18 months ago. It is sincerely hoped that more reassuring news will shortly be forth coming. * Louisa Jane Hankin (nee Carruthers) put a memoriam in the Wanganui Herald 24 Nov 1919 which read: .. Bert Brebner Cumberbeach who died at Wanganui Nov 24th 1918. "gone but not forgotten". Inserted by his aunt L. J. Hankin. Robert & Margaret named two other sons, John Paul Carruthers Cumberbeach & William Alexander Cumberbeach. Huon Times, 6 July 1917WEDDING BELLS The wedding took place on Wednesday, June 27th, at the Franklin Church, of Miss D. Douglas, daughter of Mrs and the late Mr Douglas; and Albert, son of Mr and Mrs Wm. Hankin, both of Geeveston. Rev Father Hennessy officiated. The bride wore a beautiful costume of blue serge and was attended by Mrs M. Hankin as bridesmaid, the groomsman being Mr Marshall Hankin. The wedding was quietly celebrated as a brother of the bride is returning the next few day from the war badly wounded. The young couple have a very wide circle of friends and were the recipients of many presents, coupled with best wishes for their future happiness. The Mercury, 30 Nov 1937 An Interesting Experiment In the Huon district, it is usual to space apple trees 16ft apart, and while this, in conjunction with the refinements of cultivation usually practised, may be regarded as constituting an intensive system of apple production, there are a few orchards in which much closer spacing has been employed with interesting results. The orchard of Mr Albert Hankin, of Geeveston, ls an excellent example of Intensive planting, the spacing being 9ft to 10ft between trees, with rows 12ft apart. Mr Hankin, who is a son of the late Mr William Hankin, a pioneer Geeveston grower, purchased his present property from Mrs Cecil Riley, whose, husband's father, Mr James Riley, acquired it as bush land. When Mr Hankin took over the block it consisted mainly of scrub, with a little grass-land and about half an acre of orchard which had been planted on a 12ft by 9ft spacing by Mr Riley. Mr Hankin cleared and grassed most of the land, establishing good paddocks close to the homestead and some 13 years ago, he Increased the orchard to four acres, retaining the original spacing. The land, which is of boulder clay type of glacial origin, was covered with ti-tree scrub and in places lay very wet. This moisture Mr Hankin controlled with tile drainage, which functions admirably. Some idea of the drainage problem may be seen in an area of about half an acre of healthy young trees growing on what was formerly a quaking bog. This area received 1,200ft of tiles. The trees, at 13 years old, are yielding an annual crop of 2,000 bushels or 500 to the acre and their vigour and uniformity provide a tribute to the effectiveness of the regular manuring and cultivation they have received. The main varieties are Jonathan, Alfriston, Sturmer and Democrat. Advocate, 6 March 1928 DIVORCE CASE His Honor granted a decree nisi, returnable in three months. Herman Bernard Hankin, who sought the dissolution of his marriage with May Edith Hankin, was represented by Mr A. E. Richardson and Henry Tuttle was cited as co-respondent. Hankin, who is a labourer residing in Hobart, stated in evidence that he married the respondent on October 1, 1917 in Franklin and they had lived at Sandy Bay. In October 1925 he went home from work and found that respondent had packer things and left him. Shortly afterwards he heard from her at Sydney. She returned at his request, offering no explanations of her conduct. Frequently she stayed away from home all night and, becoming suspicious, he suspected her relations with Tuttle. As a result he and a friend named George Pelham watched her and on four consecutive nights saw her enter a house in Bathurst street in company with Tuttle in the early evening and not leave until the morning. The decree nisi was granted. The Mercury, 23 March 1934 CUSTODY OF CHILDREN An application arising from the divorce suit Hankin v Hankin and Tuttle, in which a decree absolute was declared on September 17, 1928 came before Mr Justice Crisp in Chambers at Hobart yesterday. Mr J. D. Morris (Ogilvie, McKenna, and Morris) appealed for Edith May Tuttle (formerly Hankin and Mr A. E. Richardson for Herman Bernard Hankin, the petitioner in the divorce suit. Mr Morris applied for the custody of two children of the Hankin marriage, Lionel George (1919-1935) and Desmond Maxwell (1921-1996), who are at present in the custody of the father. After evidence had been given and lengthy argument, His Honor made an order, by consent, that the children should be transferred to the custody of their mother. NOTE Another son, Douglas Bernard Hankin (1917-1980) (born 1 Oct 1917, later known as Tuttle), was described in Aug 1930, as a neglected and uncontrollable, 13 year old child. His mother discharged him to become a child of the State. He lived at Ashley Home for Boys at Deloraine. He was also charged with stealing a bicycle and horses. He was allowed to go stay with his mother in Hobart for the Easter holidays in 1931 so long as she refunded his fare. The engagement is announced of Elsie, eldest daughter of Mr and Mrs F. W. O'Brien, South Hobart, to Bernard, the third youngest son of Mary and the late William Hankin of Geeveston. * Herman and Elsie Gladys O'Brien (1894-1931) married later that year. Huon Times, 30 June 1915 HANKIN-McINERNEY A wedding was celebrated at Franklin between Miss M. McInerney, daughter of the late Mr and Mrs J. McInerney and Mr Marshall Hankin, son of Mr and Mrs Wm Hankin, both of Geeveston. The officiating clergyman was the Rev Father Hennessy. The bride was given away by Mr W. Warren. Miss L. Dwyer made a charming bridesmaid and Mr Herman Hankin, brother of the bridegroom, was groomsman. After the ceremony Mr and Mrs Hankin motored to Huonville, where the wedding breakfast was partaken of, and thence to Hobart, where a few days were spent prior to taking up their residence at Geeveston. The newly married couple, who have a large circle of friends here, were the recipients of a large number of beautiful and valuable presents. The Mercury, 21 Nov 1906 DEATH On November 11 1906 at her parents' residence, Geeveston, Mary, the dearly beloved and only daughter of William and Mary Hankin, in the 9th year of her age, after a long and painful illness. R.I.P. Mr and Mrs Hankin beg to sincerely thank all kind and sympathising friends and especially Mr and Mrs Mulligan, school teachers at Geeveston, in their sad bereavement.